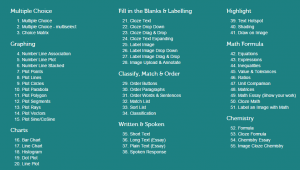 Earlier I wrote a blog post on my first steps into Maple Graded questions in MapleTA, helping me to grade variations of the correct answer in student’s response. For the next run of the class we piloted last year, we wanted to improve the grading. and saving time on grading the exam. I managed to simplify the grading code with help from the MapleTA Community. I used ‘wildcards’ to capture the essence of a formula and used the Maple substitution function (subs and algsubs) to allow for the various notations the students would write for the correct response. If you want to see the code I used: visit the Maple TA and Mobius Community , (register) and search for my posts (@metahofzicht). At first I was directed towards using procedures in the algorithm section in MapleTA. The example I got via the forum was brilliant (including easy checking of the code) but I got stuck, when using multiple response fields in my questions. (Still need to ask an expert what went wrong), but moving the grading to the grading code section of the response field resolved the issue. Unfortunately it introduced another hurdle: I had to start using Maple to check my code. I had to use it for its debugging functionality, since regrettably TA lacks this essential feature. The disadvantage of having to use Maple for debugging is that syntax differs between the two. Some functions are ‘translated’ automatically when copy/pasting it from Maple into TA, but not all (especially not the parameter notation). The main advantages of the new way of coding, was that it was way easier to read and correct typing mistakes in the formulas and since it was a lot shorter, it ran faster. In the first exam (june 2016) some questions took some time to load. This year’s exam and retake went very smooth. Firstly, our lengthy discussions on how to pose the question (learning goals, texts, scoring and presentation) in the previous year, provided us with some sort of a blueprint for this particular course. This helped the instructor create new exam questions quicker and in a format that made clear how to do the programming and grading. Secondly, the instructor made sure he tested the exam extensively beforehand to minimize the number of mistakes afterwards. Thirdly, the students came in better prepared since they learned how to use TA and had practiced its syntax from day 1 of the course. They had access to three example exams to practice with. Grading the exam was quick, even though the number of participants exceeded expectations (500+). This process turned out to be the biggest time saver despite some small corrections needed. Being able to regrade a question would certainly have speeded up these corrections, but for now we could only conclude that digital testing actually can save time (only after a big time investment earlier). If you want to know more about the pilot and its findings you can find an article about it on Maplesofts website in the technical Research Papers section : Digital Testing in Engineering courses. In August 2016 we upgraded to Maple TA version 2016. A moment I had been looking forward to, since it carried some very promising new features regarding essay questions, improved manual online grading and a new question type I requested: Scanned Documents. Some teachers would like to have students make a sketch or show their steps in a complex calculation. Because these actions are hard to perform with regular computer room hardware (mouse and keyboard only) it would be nice to keep those actions on paper, but how to cleverly connect this paper to the gradebook. In my blogpost from may 2013 I mentioned an example of a connecting feature from ExamOnline that is now implemented in Maple TA. 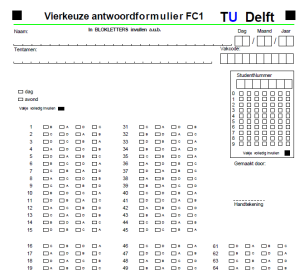 Last friday we had the first exam that actually applied this feature in an exam: about a hundred students had to mark certain area’s in an image of the brain on paper. The papers were collected, scanned and as a batch uploaded to MapleTA’s gradebook. The exam reviewers found the scanned papers in the gradebook and graded the response manually. First, in order to use the batch upload feature, you need to create a paper form that can be recognized in the scanning process. Our basis was the ‘Sonate’-form (see image 1). Sonate is our multiple choice test system for item- and test analysis. This form has certain markings that can be recognized by the scan software, Teleform. This form was converted into a ‘Maple TA form’ (see image 2). 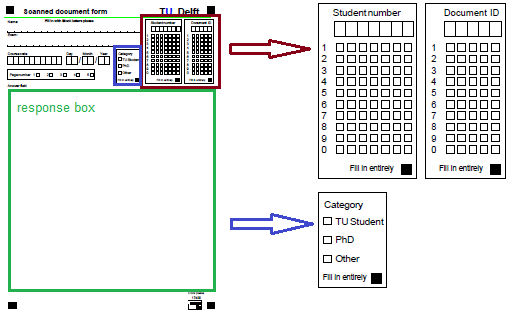 The form was adjusted by creating a response box (in green), an entry for student and Document ID (in brown) and a user category (in blue). The document ID is created by MapleTA. It is a unique numerical code per student in the test. In the scan software a script is written that creates a zip-file containing all the scanned documents and a CSV-file that tells MapleTA what documents are in the zip. As soon as the files are created and saved, automatically an e-mail is sent to support. The support desk uploads the files to MapleTA and notifies the reviewers that all is set. 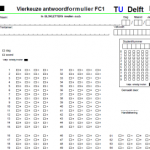 In the gradebook a button is shown. When you click it, it will open the pdf file so the reviewer can grade the student’s response. This feature is very promising for our online students. When using online proctoring at the moment they use e-mail to send attachments. Now they might use MapleTA . As long as the file type is allowed. 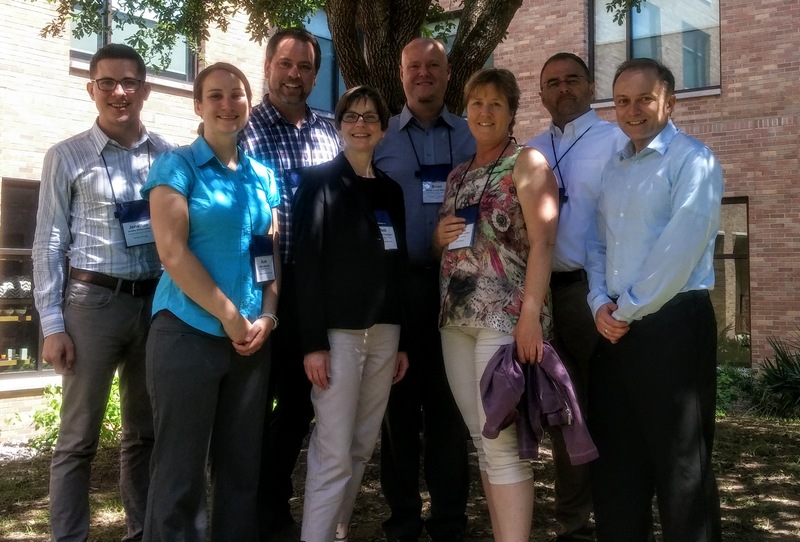 This month I got the chance to attend the Educause Learning Technology Leadership Institute (LTL-2016) in Austin Texas. None of my colleagues were familiar with this institute so I got to be the guinea pig. To me it seemed interesting to be in an institute with all people working in the same line of work, coming from different schools or universities (in fact, rule is that only one participant per school is allowed) who will work in a team on a so called ‘culminating’ project. A couple of weeks prior to the institute a yammer network environment was set up, so everybody could already introduce themselves. During the week that we all would be in Texas, we would share information and have discussions through yammer. Major goal for this week was networking and sharing experiences in our daily practice. With all of us being in the same line of work, discussions were very interesting and it was rather easy to relate to the problems posed by both faculty and participants. The vast majority of the participants were American, coming from all kinds of schools and universities all over the US. Only three participants from Europe/Middle East: University of Edinburgh, Northwestern University (in Qatar) and TU Delft. To my surprise there were almost 50 participants divided over 7 round tables. In total 7 members of faculty that would lead the institute. They were typically participants of previous versions of this institute and could tell what participating in this LTL institute had meant for their career and building a network of relations throughout the country. Each day, coming into the room, you had to go find your name tag on one of the tables, making sure you would talk to as many people as possible and not go for the same group all the time. For the first two days: this worked out fine: The introduction of a specific topic, followed by a small assignment or group discussion, would allow you to get to know a bit more about the people at your table. But since you were supposed to work in a (fixed) team on a joint project (the people from the table you sat at on the second day) this idea got kind of distorted over time: You tend to want to be with your team to discuss the impact of the topics being ‘taught’ by the faculty members, rather than yet another person whom you had to ‘get to know’ first. On top of that most of the topics of the third and fourth day were shaped as lengthy presentations leaving hardly any time for discussion. Working in the team on our project was great. Our team had good discussions about improving digital literacy for both students and teachers. Going into depth and having to ‘create’ our own school, writing a plan on how to improve digital literacy and finding the right arguments to defend our plans in front of the stakeholders (dean, provost, CIO, CFO, etc.) were quite interesting. It gave me a more profound insight in the differences and similarities between the European and North American universities. On the last day I spoke to the participant from Edinburgh and we discussed (shortly) whether an European version of this institute could be a good idea for the future. From a networking perspective I believe this could be a very good idea. I would be interested on being involved setting it up, so Who knows…. I have been using MapleTA for a couple of years now and so far I did not use the Maple graded question type that much. I did not feel the need and frankly I thought that my knowledge of the underlying Maple engine would be insufficient to really do a good job. But working closely with a teacher on digitizing his written exam taught me that you don’t have to be an expert user in Maple in order to create great (exam) questions in MapleTA. A couple of months ago we started a small pilot: A teacher in Materials Science, an assessment expert and me (being the MapleTA expert) were going to recreate a previously taken, written exam into a digital format. Based on the learning goals of the course and the test blue print we wanted to create a genuine digital exam, that would take an optimal benefit of being digital and not just an online version of the same questions. The questions should reflect the skills of the students and not just assess them on the numerical values they put into the response fields. Being so closely involved in the process and together finding essential steps and skills students need to show, really challenged me to dive into the system and come up with creative solutions mostly using the adaptive question type and maple graded questions. This way the chance of guessing the right answer was eliminated, resulting in not having to compensate for guessing in the overall test score. The problem itself was posed to the students in a more authentic way: Here is the situation, what steps do you need to take to get to the right solution. Posing that main question first requires the students to think about the route, without guiding them along a certain path. A numerical question was also expanded into a main-sub question scenario. This time, when students would answer the main question correctly (requiring to find their own strategy to work towards the solution) they are taken to the next question since they’ve shown they succeeded in solving the problem. Those who did not get to the correct answer, were given a couple of additional questions, to see at what point they went wrong and thus being able to solve the problem with a little help. Still being able to gain a partial score on the main question. Another adaptive question scenario would require all students to go through all the main-sub questions. Using the sub questions either to underpin the main question or as a help towards the right solution by presenting the steps that need to be taken. Again allowing students to show more of their work and thoughts than a plain set of questions, without guiding students to much on ‘how to’ solve the problem. So far the adaptive questions, but what about the maple graded? The exam required students to type in a lot of (non mathematical) formulas used to compute values for material properties or deriving a materials index to select the material that best performs under particular circumstances. Maple can evaluate these type of questions quite well, since the order of different terms will not influence the outcome of the evaluation. We first tried the symbolic entry mode, but try-out sessions with students turned out that the text entry mode was to be preferred. Since it would speed up entry of the response. This turned out to be a powerful way to reassure students their response would not be graded incorrect through syntax mistakes or not elaborating their response to the right level. In order to use adaptive sections in a question all questions must be graded automatically. This means you cannot pose an essay question, since it requires manual grading. We had some questions were we wanted the students to explain their choice by writing a motivation in text. Both the response to the main question and the motivation had to be correct in order to get full score. No partial grading allowed. Naturally, the teacher should also review the responses that did not contain these key words, but certainly that would mean only having to grade a portion of the 600 student responses, since all the automatically-graded-and-found-to-be-correct would no longer need grading. Thus saving a considerable amount of time. It requires careful thinking and anticipation on student behavior. Make sure to have your students practice the necessary notations, so they are more confident and familiar with MapleTA’s syntax or ‘whims’ as students tend to call it. Take your time before the exam to define the alternatives and check in detail what is excepted and what is not. This saves you a lot of time afterwards. Because unfortunately making corrections in the gradebook of MapleTA is devious, time consuming and not user friendly at all. Opzet gebruikersgroep voor Maple T.A. Als TU Delft hebben we het initiatief genomen om een gebruikersgroep te gaan vormen voor MapleT.A. In het hoger onderwijs wordt Maple T.A. op vele plekken ingezet. Maple T.A. krijgt met iedere versie uitgebreidere mogelijkheden om digitaal toetsen naar een hoger plan te brengen. Om deze mogelijkheden beter te benutten en de her- en der opgedane Maple T.A. kennis en ervaring niet verloren te laten gaan maar juist te delen en te borgen, willen we een gebruikersgroep starten. Met onderstaande enquête willen we graag de behoefte onder Maple T.A. gebruikers peilen m.b.t. deelname aan een gebruikersgroep. Binnen een paar dagen zijn al bijna 20 reacties binnengekomen vanuit diverse instellingen, dus we zullen zeker gaan starten. Fully Automated Solutions: The computer monitors students and determines whether they are cheating. Record and Review: Sessions are recorded as the computer monitors students. A human can then review the video at any time afterward. Fully Live: Students are on video and watched remotely by a live proctor. There seems to be a tendency to move towards fully automated solutions, since it is more cost efficient and the technical solutions become more and more available, like multi factor authentication, eye-tracking and automated cheat detection. There are also systems that integrate into the institutions test delivery system or LMS. The systems that still use live proctoring (whether it is a live proctor or a review) also use advanced technologies to help the proctor detect cheating. Eduventures promises to keep covering these systems and providers so the coming months I expect more in depth information on developments in this sector. Interesting! Now that TU Delft invested into creating large computer rooms for digital exams, it is of the essence to make optimal use of these rooms. Still the majority of the exams are paper based and not all exams can or should be converted into automatically marked exams. Seeing the positive response of students towards computer exams I wrote about in my previous blog post, I decided to search for tools for taking exams existing of essay and short answer questions, combined with functionality on easy onscreen grading. I got inspired by Roel Verkooijen’s presentation about Checkmate at a meeting of the Special Interest Group Digital Assessment. Working with this system, the exam itself is still taken on (special) paper, the review of the exams is done onscreen. The paper exams are scanned. In the reviewing screen, the question, the model answer and the scanned student response are shown and the reviewer can add comments. The system keeps track of the progress of reviewing and facilitates working with different reviewers. Students can review the grading online and even discuss the comments made within the same system. I find that the major disadvantage of Checkmate is that this system still relies on student’s handwriting. Checkmate is tailormade for Erasmus MC, so unfortunately not available to other institutions. At the moment I’m experimenting with CODAS. 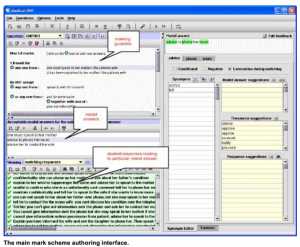 This is text grading software that ranks documents according to their level of similarity with certain selected documents; to what degree do they resemble good examples or the poor examples. With CODAS an instructor only needs to grade about 30 to 50 assignments in order to get a reliable ranking of the documents. CODAS can also perform a plagiarism check. The experiment I’m doing is about finding out what kind of exam questions, or better, what kind of short answers can be revised reliably with this system. CODAS requires digital input (*.txt format), put the system does not provide that itself. C-rater by Educational Testing Service (ETS) uses natural language processing (nlp) to assess a student’s answer. It can be used to grade open questions that require a converging answer. It can not handle questions were a student’s opinion or examples from the student’s own experience is required. Even though C-rater corrects for misspelling, use of synonyms, paraphrasing and context it does not reach the same level of reliability of human marking. The exam designer and the answer model builder need to be quite knowledgeable on the C-rater’s mechanisms in order to get a good result. Another drawback is that the system needs up to 100 scored responses to build the answer model. The system is still being improved. 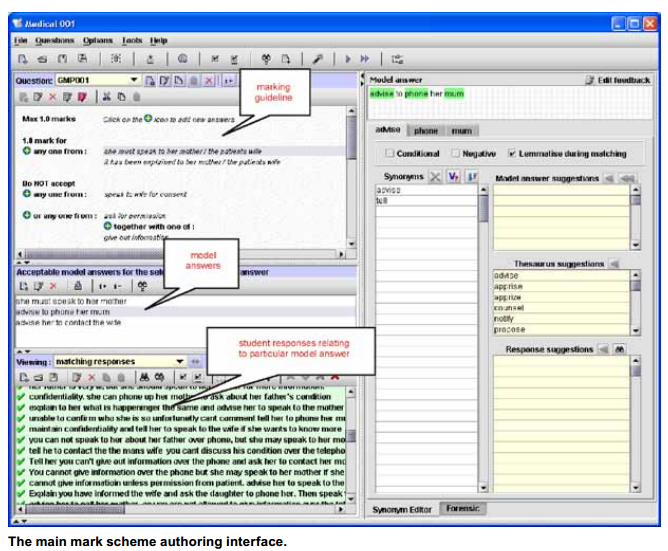 ExamOnline by Intelligent Assessment Technologies (IAT) uses marking schemes (model answers) that are added by human markers to assess a student’s response. 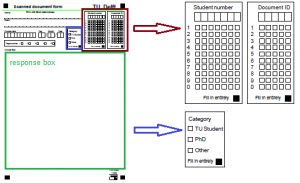 The system provides an exam delivery system and facilitates onscreen grading. The grading is a combination of computer and human marking. Another interesting feature this software offers is the possibility to add hand-drawn sketches to a digital exam. When a sketch answer is required, the system shows the student a unique code that the student needs to fill in on the paper sketch. Afterwards, when the sketches are scanned the system automatically connects the scan to the student’s exam so the grader can assess the sketch onscreen. I am very curious what OnlineExam can offer, I hope to be able to experiment with this software to see if it might meet our needs. 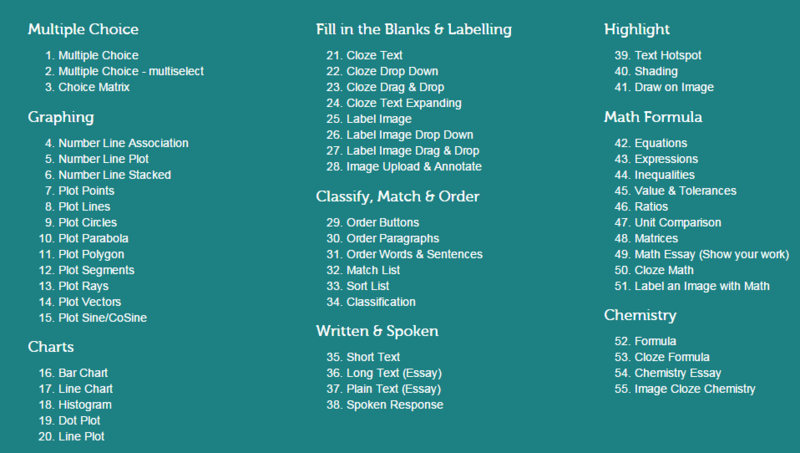 On top of that, in 2 weeks I hope to get a sneak preview of MapleTA’s new features on essay questions. The current version of MapleTA (8.0) provides a reasonable editor to students answering an essay question, but the grading screen is by far not practical for onscreen grading of short answer questions exceeding 30 words.